Today is the last day of our monthly Home Organization Challenges. By the end of today’s challenge you should have a detailed cleaning list for each room in your home and each item should be separated by how often it needs to be cleaned. Starting Monday, you can begin checking items off of your detailed cleaning list. Remember, to only work on one zone per week. Today we’re going to finish up the monthly challenges by making detailed cleaning lists for the garage and yard. If you also have a shed or basement you’ll make lists for those rooms as well. Grab your paper and pen and begin making your list starting at the ceiling and working your way down to the floor. I know, the yard doesn’t have a ceiling, but you know what needs to be done, in fact, you might want to have your hubby create these lists, since this is usually his domain. When you’re finished creating the lists decide how often each item needs to be cleaned. Now that you’ve completed your garage and yard lists, transfer the items onto the appropriate section of the printable. 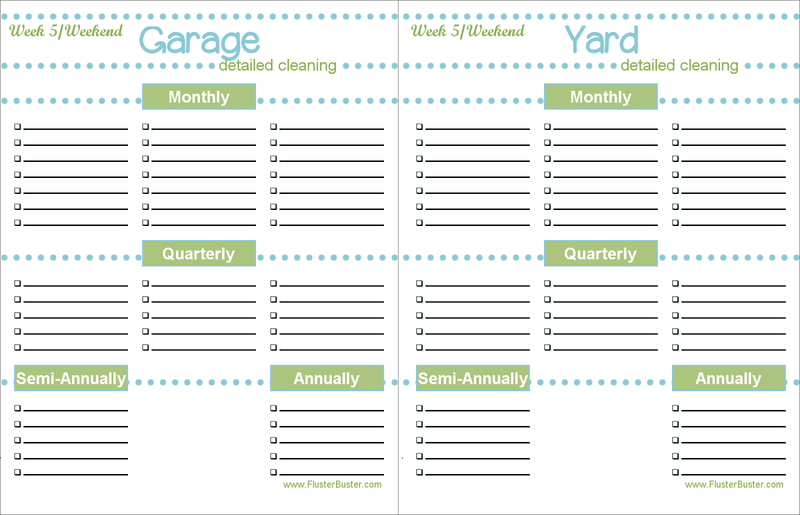 Place the printables into a sheet protector and file it under the monthly tab of your Reminder Binder.